Buprenorphine (as HCl), naloxone (as HCl dihydrate); 2mg/0.5mg, 4mg/1mg, 8mg/2mg, 12mg/3mg; sublingual films; lime-flavor. Do not cut, chew or swallow. Avoid food or drinks until film dissolves. Give by sublingual (SL: under the tongue) or buccal (inside of cheek) administration. Place additional films sublingually or buccally on opposite side from the first film if needed; should minimize overlapping. Start when clear signs of withdrawal occur; individualize based on type and degree of opioid dependence. Supervised induction (use SL route): Day 1: initially 2mg/0.5mg or 4mg/1mg; may increase in increments of buprenorphine 2mg or 4mg at 2-hr intervals, up to 8mg/2mg based on response; Day 2: a single dose up to 16mg/4mg. Dependent on heroin or short-acting opioids: initiate induction with either Suboxone film or buprenorphine monotherapy (SL tabs) at least 6hrs after last opioid dose. 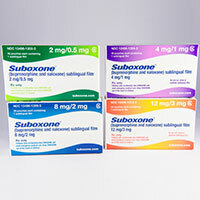 Dependent on methadone or long-acting opioids: initiate buprenorphine monotherapy (SL tabs) for induction, then transition to once daily Suboxone. Maintenance phase: (target dose): 16mg/4mg once daily; adjust in 2mg/0.5mg or 4mg/1mg increments/decrements; (usual range): 4mg/1mg–24mg/6mg once daily. Switching between buprenorphine or buprenorphine/naloxone tabs and Suboxone films: start on same dosage as previously; may need dose adjustments between products; monitor for over- or under-dosing. Switching between various Suboxone film strengths: systemic exposures may be different; monitor for over- or under-dosing. Hepatic impairment (severe): not recommended; (moderate): avoid use for induction. Concomitant use or discontinuation of CYP3A4 inhibitors or inducers: monitor closely and consider dose adjustments (see full labeling).